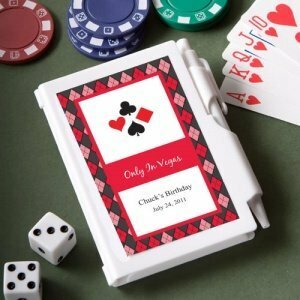 You can bet your guests will love these fun and handy notebook casino themed favors! Perfect for your Vegas wedding or casino themed event, your guests will remember your special day each time they jot down a note. Each 3 1/4" x 4 1/4" notebook favor opens to reveal a blank white notepad inside and an easily accessible white pen attached. Personalization included, choose from a variety of color combinations, border designs and theme designs to match your occasion along with 3 lines of custom text.